STEM Day 2017 was another great success. 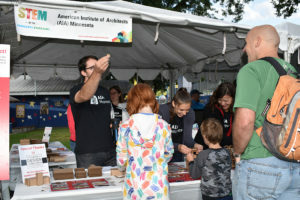 Over 13,000 Fair goers came through Dan Patch Park throughout the day. 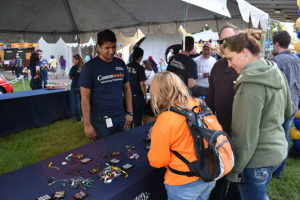 There they experimented with building design, learned to code, played with robots, explored energy from citrus fruit, and marveled at just what can be done with science, engineering, technology, and math. 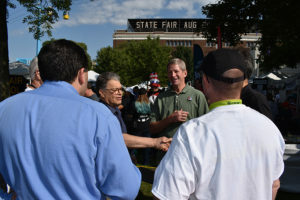 Governor Dayton proclaimed the day STEM Day at the Fair day in Minnesota, and Senator Franken stopped by to meet exhibitors and Fair goers. WCCO brought turned many young people into meteorologist with their green screen, while the Raptor Center brought their magnificent birds. We honored the states Presidential Award for Math and Science Teaching nominees, watched the University of Minnesota’s Physics Force do amazing things with 55 gallon drums, and laughed at Real Sciences jokes. 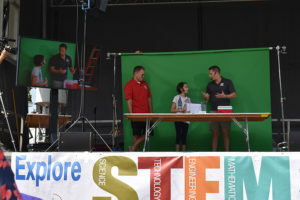 Many thanks to our sponsors for making STEM Day at the Fair happen. Platinum: 3M, Boston Scientific, and Smiths Medical. Silver: Seagate Technology and Orbital ATK. T-shirt sponsor: MTS Systems, tote bags sponsored by MnDOT. Planning for next years STEM Day at the Fair will begin after the new year.